Power Forward Pau Gasol has signed a new contract with the San Antonio Spurs, while point guard Derrick Rose will play next season with the Cleveland Cavaliers. 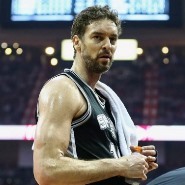 Gasol, 37, announced in his Twitter account that he will stay with the team, but refused to reveal any further details on the matter until an official statement was released by the Spurs. According to media reports the Spanish player will stay in San Antonio for three more seasons, meaning that if he fulfills his contract he would have played for 20 seasons in the NBA. ESPN reported that the Spanish player agreed to lower his salary to leave the Spurs enough cap margin so the Spurs can sign other players that could help them be more competitive. The new Cavs acquisition, winner of the 2011 MVP award, comes from the New York Knicks. Last season, Rose averaged 18 points, 4.4 assists and 3.8 rebounds, in the 64 games he played. Rose, who signed a $2.1 million contract, was hired to replace point guard Kyrie Irving who last week announced that he no longer wants to play along James and requested to be traded to an organization where he can be the focal point of the team. Irving knows that won’t be possible playing in Cleveland along a star such as James.